This story reveals the remarkable life of a Native American boy named Wassaja, or "Beckoning," who was kidnapped from his Yavapai tribe and sold as a slave. 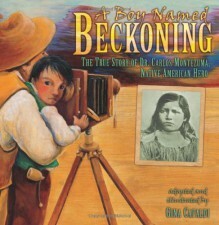 Adopted by an Italian photographer in 1871 and renamed Carlos Montezuma, the young boy traveled throughout the Old West, bearing witness to the prejudice against and poor treatment of Native Americans. Carlos eventually became a doctor and leader for his people, calling out for their rights. Gina Capaldi's exquisite paintings bring to life excerpts from Dr. Carlos Montezuma's own letters describing his childhood experiences. The culminating portrait provides an inventive look back into history through the eyes of a Native American hero.